I absolutely love a new year. A time to refocus, a time for new beginnings, a time for a fresh start, oh yeah and a brand new cute calendar (I have like 5 and am looking for more)! With it being a new year, I am taking this time to refocus and get organized. With some time off to celebrate the holidays with friends and family, I will be getting back to my regular weekly blogging schedule and have a few changes and additions in store. First up is my “Website Wednesday” feature. Over the years I have highlighted various ‘recipe resources,’ from a “Cookbook of the Month” to different cooking magazines. This entailed me selecting one of these resources and highlighting a different recipe each week for a month. This all started because I have a whole boat load of cookbooks (#cookbookhoarder) that I had recipes bookmarked to make but would never get around to making them. “Cookbook of the Month” cured this problem. But cookbooks aren’t the only place I obsess over recipes. I have a whole binder full of clipped recipes from magazines; not to mention all the recipes I have bookmarked and ‘pinned’ from various recipe websites; thus became the “Magazine of the Month” and “Website Wednesday” series. This year I wanted to focus on the recipe resource most near and dear to my heart, blogs! I have been in the blogging world for many years now, and not only am I sharing recipes and cooking tips through my blog; I am reading, following, and getting to know fellow bloggers (sounds kinda stalkerish when you write it all down). 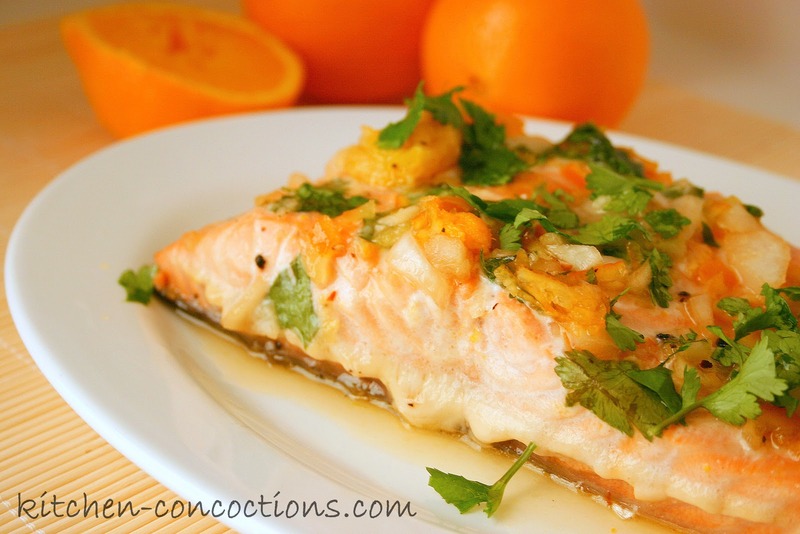 The first ‘bite’ is an Orange Teriyaki Salmon recipe adapted from Our Best Bites! Salmon is probably my absolute favorite fish, but unfortunately it can be expensive and so we don’t have it as often as I would like. 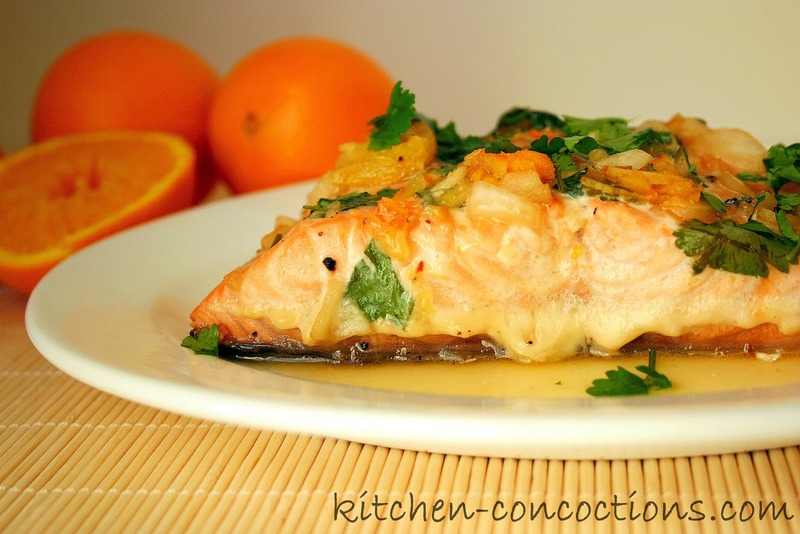 With that said, I have made this salmon recipe several times over the past several months! 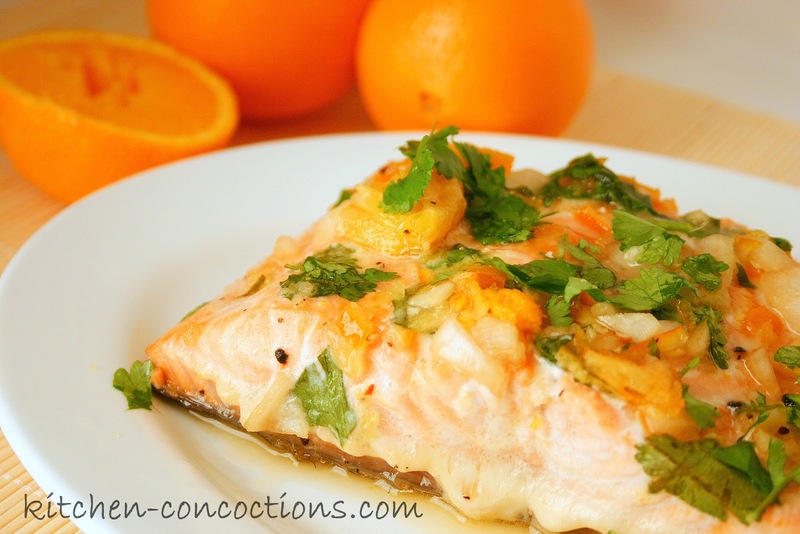 I love the bright orange flavors of this salmon paired with the sweet and salty teriyaki sauce. Don’t be turned off by the rather lengthy ingredient list, most of them are pantry staples and this meal comes together quickly and bakes under 30! Preheat oven to 325 degrees. Layer a piece of heavy duty foil over a large baking sheet Lay one more sheet of foil in the opposite direction, leaving about 8-inches of overhang on all sides. Rinse salmon in cold water and pat dry. Place salmon skin side down on baking sheet. Place marmalade and butter in a small microwave safe bowl and microwave for 30 seconds, or until butter is melted. Stir in remaining ingredients, stirring until smooth. Starting from one end, gather together the excess foil and roll together to seal into a tent-like pouch. Bake in preheated oven for 25-30 minutes, or until fish becomes opaque and flakes easily with a fork. Serve salmon with sauce spooned over top.